When Milhouse needed the toilet, he visited The Android's Dungeon & Baseball Card Shop, and was forced to buy something to use the toilet. He asked if he could buy a photo that he saw. 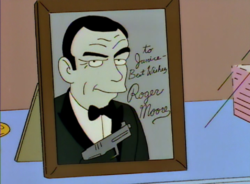 He could not afford the photo, as it was a rare photo of Sean Connery signed by Roger Moore, worth $150. Modified on November 8, 2014, at 06:06.